Latest News on 04th August 2015: BOB PO Final Result has been uploaded for 1200 Probationary Officer Admission to BSMB for year 2015-16. The list of selected candidate for 16th, 17th, 18th Batch has been published on official website www.bankof baroda.com. BOB has also released waiting list of selected candidates who will be considered for admission to 19th Batch (If required). The date of reporting for Joining formalities is 24th August 2015 for 16th Batch candidates. The offer letter of appointment will be sent to the these provisionally selected candidates up to 14th August 2015 by email or SMS to their registered email ID or Mobile number. These candidates will send a return email for the consent of appointment for the probationary officer admission to BSMB for Year 2015-16. Download BOB PO Final Result 2015 Merit List BOB PO Interview Letter 2015 Released - BOB PO Result 2015 Declared – Download BOB PO Scorecards Marks Details Merit List GD & Interview Schedule – bankofbaroda.com. BOB PO Interview Letter 2015 has released on 19th June 2015 on official website www.bankofbaroda.com. Those candidates who had qualified in written test and waiting for BOB PO Interview Letter 2015. It is latest news that BOB PO Interview letter 2015 can be downloaded from 19th June 2015 onward from official website for Group Discussion and Personal Interview which is going to be conducted from 23rd June 2015. The direct link is given here for the convenience of the candidates. The candidates can also reprint BOB PO Application form up to 20th August 2015 which will be required in GD and Personal Interview of the candidates. The List of Shortlisted candidates called for interview based on cut off marks will be released on the official website. 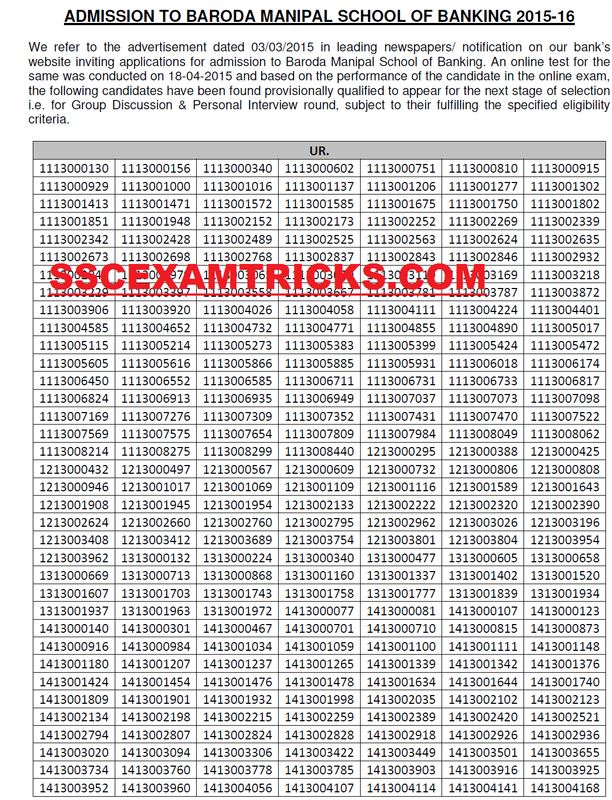 Candidates will be scored equal to or greater than the cut off marks to qualify for interview round. The cut off Marks Result will be released category wise along with name, father name, roll number, date and venue of interview. The qualified candidates will be called for personal interview of the candidates. The personal interview will be conducted with original document verification of the candidates at the venue of personal interview. · One set of self-attested of all the documents to the venue of interview. · 10th Certificate is used for Age Proof. · Two extra colored recent passport size photograph (same as pasted on computer generated application form) required for application form or other document requirements. · Some questions may be asked from Present Economic Scenario. Bank of Baroda (BOB) has released online result on 06th May 2015 on official website for written examination which was conducted on 18th April 2015 for BMSB Selection Exercise-2015-16 for Banking Course program of 1 year Post Graduate Diploma in Banking and Finance course in Baroda Manipal School of Banking, Bangalore or in any other Institute in other part of the country, as decided by the Bank for a total of Intake of 1200 Posts of Probationary officers Pay Scale emoluments (salary component only) of Junior Management Grade/ Scale-I Officer, including DA, HRA, CCA are approximately Rs 3.86/- lakhs in a Metropolitan Centre. Earlier BOB had invited online application from 03rd March 2015 to 17th March 2015 on the official website. A huge numbers of candidates had applied for this examination. Those candidates who have applied for the post and appeared in exam, then waiting for result; they can download their result from the direct link provided below. The written examination was conducted on 18th April 2014 by ONLINE Mode. The exam was consisted of various sections containing questions of English, Reasoning, Quantitative Aptitude, General Awareness each of 50 marks. The exam was a multiple choice question paper of 200 questions of 200 marks in which five options were provided out of which candidates needed to choose one correct answer. The time duration for exam was 2 hours or 120 minutes. There was negative marking for any wrong answer. Candidates can download tips-tricks & General Awareness questions answers sets for WBJEEB JELET Entrance Exam 2015 which are prepared from most popular books specially for the candidates to achieve cut off marks for getting qualified for IDBI Executive Exam 2015. Tips are prepared with smart work to qualify IDBI Executive Exam 2015 in first attempt. The aggregate marks of candidates qualifying in the Online Test will be arranged in descending order in each category and the candidates in the order of merit, subject to 4 times the number of intake in each category, will be called for Group Discussion and Interview. The qualifying marks in Group Discussion & Interview will be as decided by the Bank.